I am stunned by how many of our mission's goals we accomplished this year. Recently when I paused to reflect on how it's all come about, I was left with the resounding thought, "I am so not alone after all. I stand with and am supported by our incredible members." My gratitude overtook me. You have cast your vote with AE911Truth and placed your personal trust in our team. And I have never taken that trust lightly. Your monthly financial support is what has made our 2014 accomplishments possible — especially the success we enjoyed during our three-day September 11th activities, which we'll be reporting to you this week. Such achievements enable me and our very small staff to keep on relentlessly pursuing accountability and publicity for this cause. You could say that we have a unique partnership with you, in which we're all driven to fully expose the truth about 9/11. You see, we don't get many large contributions. Numerous small monthly donations make up most of the revenue that keeps us on the road toward awakening the world — and toward securing a real investigation. 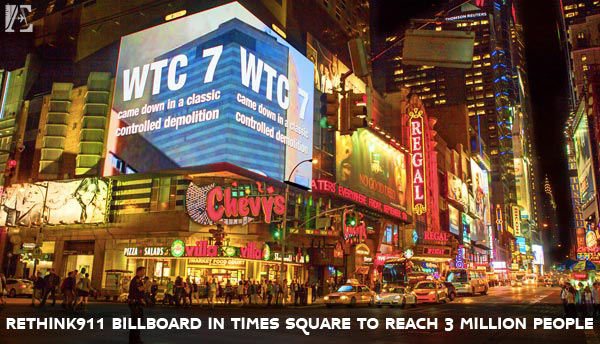 Because of YOU, AE911Truth was able to design, print, and distribute more than 5,000 copies of our Alternative Guide to the 9/11 Museum and erect a 45-foot-high video billboard that shows the world exactly how World Trade Center Building 7 was demolished. 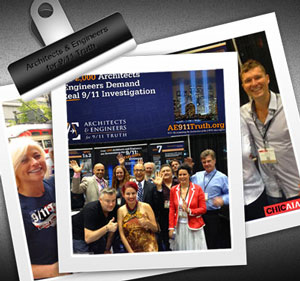 Because of YOU, we were able to present our WTC evidence booth at the American Institute of Architects national convention in Chicago, where we educated several hundred architects, more than 100 of whom have now signed our petition. At previous AIA conventions, held in Denver, San Francisco, Boston, and Washington, D.C., we reached thousands of other architects. Our efforts culminated this year in the AIA leadership finally being willing to meet with us. Because of YOU, we were able to film — and produce DVDs of — 9/11: Explosive Evidence—Experts Speak Out. Because of YOU, our fabulous COO, Kelly David, is able to provide the back-end support that makes all this outreach possible. So, YOU who have regularly put your personal resources on the line for us are the key to the successes we've had this past year — successes that resulted in our unprecedented 40-minute interview on C-SPAN's televised Washington Journal program, which millions watched. I can't possibly thank you enough, Supporter, for making all of this possible. You are partnering with us at an historic time — a time in which we have a real opportunity to break through the dense fog of denial. Through the censorship, cover-up, corruption, and criminality. Indeed, I believe we're poised for this breakthrough in the very near future. I can feel it. And because of your support, we are all over it! Thanks for having my back as I continue to serve your passion for truth.